CHIKARMY 2 is Friggin’ Sweet and You Can Order Now! FRIGGIN’ SWEET DRIVER! 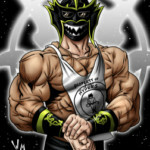 Joining Crossbones in CHIKARMY 2 is another member of UltraMantis Black’s Order of the Neo-Solar Temple – HYDRA! A whole new world of famous faces and classic story lines awaits you when CHIKARMY 2 arrives in your mailbox! The great news is you can order NOW by going here! CHIKARMY 2 starts mailing on October 15 but it could be sooner so order now to get it faster! ← Storage Wars! Last Chance to Get Games Going Out of Print!